Recently we have been examining books for leaders that aren’t necessarily leadership books in the traditional sense. In the leadership vernacular a subject of increasing interest in the past few years is that of HOPE. I have multiple books on this very subject from secular sources that are quite insightful. 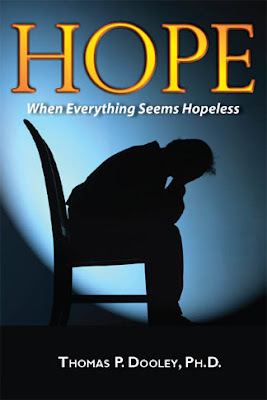 In lieu of hope, especially from a biblical vantage point, I want to recommend a new release by my good friend Dr. Tom Dooley: Hope When Everything Seems Hopeless. This is a book that those who are in the midst of a hopeless season need to read. It is also a book that leaders need to read so that they can become a conduit of hope within their God-given sphere. Go to his website at http://www.pathclearer.com/ to learn more about Dr. Dooley and his ministry. This book is published by Destiny Image. If you would like to purchase copies of Hope When Everything Seems Hopeless directly from Tom, please mail checks payable to Path Clearer Inc. for $19.00 each (this includes shipping) or for volume discounts on 5+ copies for $15.00 each (including shipping). Designate if you want any copies signed. I serve on the board of directors for Tom’s ministry so it is one that I highly endorse. I also heartily recommend his first release, Praying Faith. Back in 2004 I was trying to find a new book to get for a mentor at that time. A previous disciple of mine was working for Destiny Image Publishers who mentioned over the phone a book that was creating quite a stir within the office. It was Tom’s first release, Praying Faith. Within a few days I purchased the book intending to swiftly send it via mail as a birthday gift to a dear friend and mentor. The book never made the journey. Once I sat down and started reading it, I couldn’t put it down. Tom is a great writer, integrating sound biblical principles with excellent real life examples and scenarios. He is liberal in using stories from his own life that are insightful into both the content of the book, but also into the author. Those are the kind of books I enjoy the most. And he doesn't shy away from butchering sacred cows that impede true spiritual growth in Christ. I can attest to this from my own experience with him as I've watched him minister and through my interactions with him. If you want to purchase copies of Praying Faith, they are still available for $18.00 each (including shipping) or for volume discounts on 5+ copies for $14.00 each (including shipping). This is a great book I would definitely recommend this as a gift to anyone, but especially to a book lover who has “read everything out there” because it has a different angle that is refreshing. And I must add that Tom is a man of great gifting, but more importantly, of exceedingly great character. He’s a person I trust. And he’s a dealer of hope!